This entry was posted in Racing on May 15, 2016 by Steve Tilford. Last night I raced a criterium in Ashland Nebraska. It is a small town between Omaha and Lincoln. I had never been there, but enjoyed my short stay. The race wasn’t until 7pm, but it was still windy. And unseasonable cool, like mid 50’s. The course was great, a figure 8 on a small hill. There was over 1000 feet of climbing in 25 miles. Nothing crazy hard, but enough to make it challenging. My only complaint on the day was the corners were a little iffy. By that I mean they could have used a good sweeping. Or another sweeping if they were swept initially. There were a couple small stones in a couple of corners and all the whole pack was a little tentative, which made for a little harder race. Other than that, it was really great. An old-time, small town crit through residential area. Pretty fun. I didn’t warm up much. I didn’t ride at home before I left, which I would have normally and then only rode 6 miles before. I had the time, but wanted to run Tucker, then was messing with my race wheels and before I knew it, it was time to start. I started too hard. I got into a 4 man break the 3rd or 4th lap and rode for 4 or 5 laps off the front. I thought it had the right combination, but obviously not. 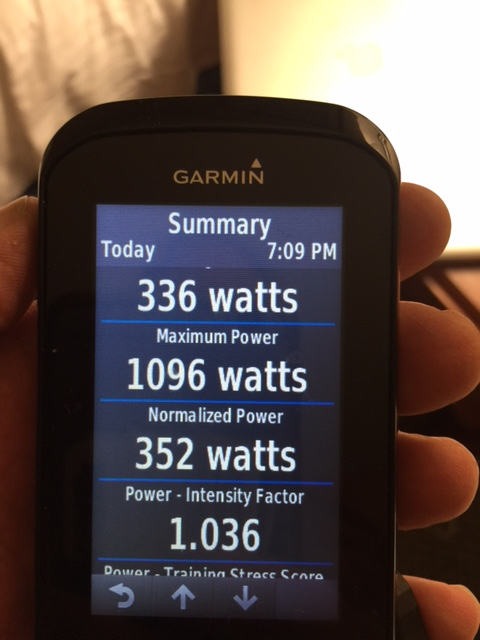 When I looked down at my average wattage after 15 minutes it was 370. That is pretty high. The rest of the race was just a race. A few other moves got away. I made pretty much all of them. Since I’m racing here alone, I just need to watch the combinations of the guys off the front and when they are correct, then I can jump up to the move. I was thinking something might work, but it didn’t. The last couple laps I sort of, in retrospect, blew it. I got bumped before a corner and went super wide with a lap and a half to go and lost 15 slots. So I had to use a ton of energy getting back up to good position. On the final lap, I was planning on jumping on the finish hill. But I got pre-jumped by Michael Allison, Olatha Subaru, and a couple other guys. I wasn’t going to chase Michael down so I just sat up. Shadd Smith was already at the front and they sort of pulled away. Anyway, I wasn’t in good position going to the last corner to the sprint, which was uphill, so made a big move and got to the bottom of the hill in, maybe, 6th or 7th. But I was out of juice and floundered up to the finish. I might have finished 10th, maybe a couple places worse, I don’t know. I couldn’t find the results online, so will just check them out at the road race later this morning. I would like to get another chance at that finish. It suited me, but I’m a little iffy right now, so I don’t know if I was just done or made enough mistakes that I didn’t have anything left at the end. The people in Ashland were super nice. The lady, who house I parked in front of, came out and asked me if Tucker needed a bowl of water. He husband was mowing the lawn on a riding mower, beer in hand, smoking a cigarette. He didn’t mow by the van because it would have been dusty. Small town neighborly. Today is a 70 mile road race. 7 laps of a 10 mile course. I hear it is sort of hilly, which would be good. And it should be windy, which I like. Should be fun. Right after the road race, Tucker and I are heading to the Driftless area of Wisconsin to meet up with Kent Eriksen and some of his buddies. I did it last year and it was super, so couldn’t pass it up. The whole area, which is south of Lacrosse Wisconsin, is huge rolling hills that are dotted with Amish farms. Super picturesque. I haven’t seen Kent and Katie for a while, so it will be good catching up. I’m going to ride up there for 3 or 4 days and then head back to Kansas to do a MTB race at Lake Wilson on Sunday. Lots of travel. Okay, need to get going, once again. I’m not sure why my Garmin and Strava have different numbers. This is the summary for my Garmin after the race. Strava said average wattage was 305 and a 330NP. The max is pitiful, but I only went hard at the end and then I was dead. 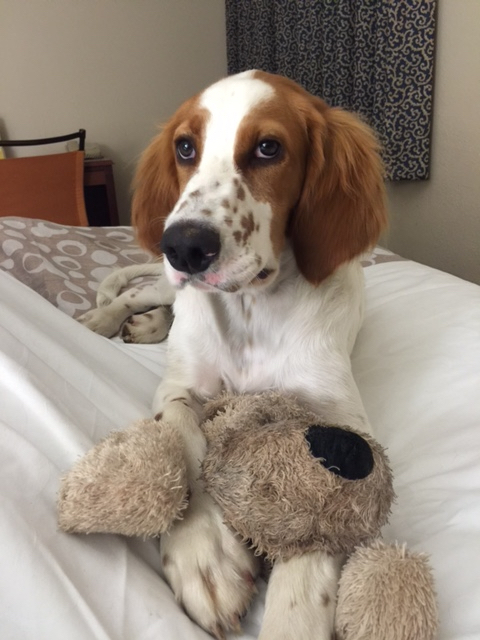 Tucke likes hotels, as far as I can tell. He isn’t much on going up and down stairs yet. We’ll have to work on that. Time to bump up that FTP setting a little..
What is that in watts/kg? That makes it more relatable. steve, whats your reason on why you didnt want to chase michael allison down? i dont understand…and why do you keep making the same mistake of not warming up enough????? i guess steve weight about 155 which is about 70 kg. that would make his watts/kg about 4.8 for the race. Change your garmin settings to include zeros in the average power and it should match or be very close to strava. I suspect this isn’t an issue for you, but if you have auto pause off….so the time keeps rolling while you aren’t moving….you will see your average speed and average power be very low. I’d advise not looking at Garmin summaries or Strava. Use a free software called Golden Cheetah or one of the many similar paid versions. These will typically have algorithms based on scientific principles for the NP calculation rather than the ones come up with by Garmin/Strava developers.